From the Mohawk, to the piercings and bursts of bright colours, Anna Polyviou is not easy to miss or forget. The pastry chef has had an international career, starting at the Sofitel Melbourne and venturing over to Europe to work alongside some of the best at Claridge's London and Pierre Herme’s famous Paris Patisserie. She returned to Australia and has reinvigorated the love of desserts at the Shangri-La Hotel in Sydney. Since, she has become known for her passion for anything sweet, hosting Australia’s first ever dessert festival in 2014 and her infamous ‘Anna Mess’ dessert on Masterchef in 2016. 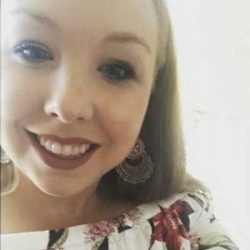 As she continues to grow from strength to strength and on the eve of her book release, High Tea Society spoke with Polyviou about all things sweet. 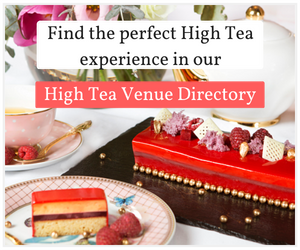 What is your favourite high tea venue? Claridges Hotel, in London over in the UK. That’s where I learnt about the beauty of afternoon tea. The room is so grand and it makes you feel that you are walking into a different magical world of elegance and perfection. Where everything is positioned correctly, everyone greets you with a smile and makes you feel as if you’re the only person in the room. The Foyer is beautiful and the stand that the afternoon tea comes on is smart and sophisticated. One thing that is mind blowing is the Marco Polo jelly in the jar that accompanies the scones. The sandwiches are perfectly cut and the spread is evenly spread from one side to the other, the scones are warm and straight from the oven and the pastries are good too. What is the most iconic item on your high tea menu at the Shangri-La Sydney? Oh this is a hard one as the menu does get changed frequently. I do always make sure it’s well balanced and everything works well together, from a chocolate item to a tart, shot glass and then a fruity mousse too. Our savoury items are well balanced and fresh every day, people do rave about them. The scones are always my favourite. My butter milk scones with tea, raisin or vanilla, with English clotted creme and my homemade jam. I use Pepe Saya butter milk that is local and super tasty, then I soak my raisins in Earl Grey tea so they’re plumped and full of flavour. All the scones are baked fresh before each seating so they are straight out of the oven and onto the plate. What dessert is a must for anyone hosting their own high tea? 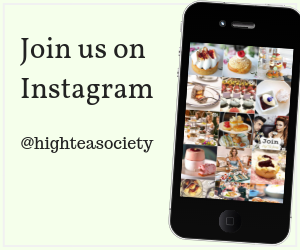 The thing is it’s not just about the desserts with high tea, it’s the whole package; from the scones, which are a must, to the fresh, tasty and well balanced savoury items. We make sure we give people options that are seafood, protein and vegetarian too. The desserts have to be petit and not massive pieces and not too heavy either. Remember desserts go on the first tier, then savoury and then scones. And have the guests eat with their eyes before they do actually eat the creations. What can people expect when they visit the Shangri-La Sydney for high tea? I have two types of high tea at the hotel. There is the traditional stand downstairs in the lobby lounge every day, where there are four sweet, four savoury and scones. The menu is regularly changed and focused on season and also making sure we cater for all taste buds. Then on Fridays through to Sundays we have Blu Bar high tea on Level 36, where there is a cocktail on arrival that represents my pink mohawk and is served in a teapot. Then a buffet that contains chocolate lollipops, chocolates, yummy scones, and also a mini cake selection too that not only visually looks great, but tastes great too. The shot currently is an apple and rhubarb crumble, the tart is strawberries and creme, the chocolate is a rich caramel slice and there is also a tropical cake that has everyone wanting more. Then the large cake changes regularly from flourless chocolate cake to cheesecakes. Let’s not forget that other important element the savoury side, from the warm savoury quiche to the egg sandwich shot, the cucumber sandwiches, salad glasses and also chicken sliders and more. You can eat as much as you wish while overlooking beautiful Sydney at the same time. 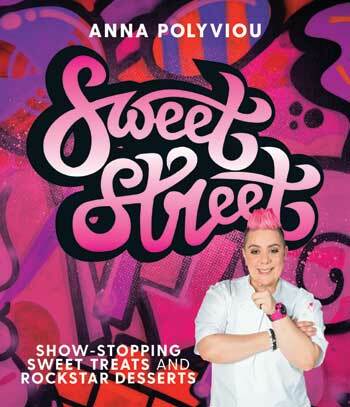 Sweet Street by Anna Polyviou (Murdoch Books RRP $39.99) Photography by Nikki To. Anna Polyviou’s Sweet Street is available from the 27th June 2018.